Having spent the last 30 years working in broadcast television and live event production in a variety of technical roles it has become plainly obvious over the last few years that we have lost some of the benefits working with the traditional PPUs with OCPs and CCUs. There are so many small HD and SDI vision mixers available nowadays since the launch of the Sony Anycast about ten years ago and more people are using these mixers for their events. The one thing that has gone by the wayside is talkback and tally. 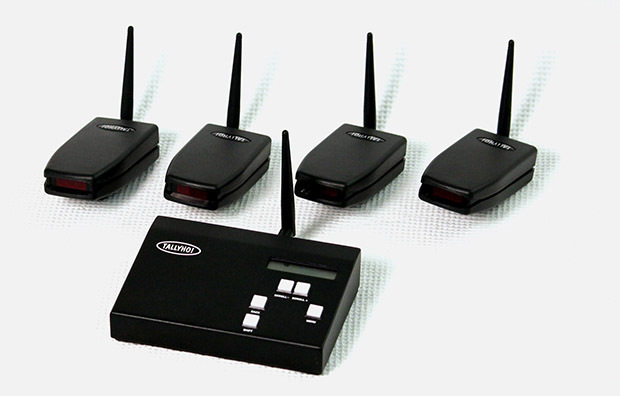 The loss of talkback has been solved through wireless systems and microwave links provide wireless video signal, but until now a tally light system, vital for the operator in situations where hearing the director due to excessive noise is simply impossible, has remained undeveloped. I tried to source a wireless tally system, but found there was no such product available on the market so I decided to invent my own. The product has been developed over the last 2- 3 years and has been used on broadcast and production events with great success and we now have the wireless tally system, Tally Ho! in commercial production. Tally Ho! gives a red light front and back on the camera and you also get a green preview light on the rear if used with certain vision mixers. More and more vision mixers will be able to give you this feature as their software is upgraded. Currently Roland mixers are able to offer you this unique feature which has proved to be extremely useful as it allows the camera man to see when he is in preview without relying on being able to hear the director. The green light illuminates in preview, turning to red when live, thus avoiding those awkward moments when going live occurs at the exact moment that the operator decides to change shot. The system consists of a Transmitter (TX) and power supply, together with a maximum of thirty two battery-powered Receiver (RX) modules. The RX units are charged with the (TX) power supply. Each camera used in a production is fitted with a wireless receiver, and the transmitter is connected to the vision mixer or editing unit. Each time the vision operator selects a camera in either preview or live selection on the mixer, a code is transmitted to the corresponding receiver which in turn illuminates a transmission tally light on the receiver. This indicator is clearly visible to both the camera operator and the subject/presenter. The TX unit is mains powered and sits alongside the mixing desk. The RX units mount onto the camera hotshoe although it can be attached in different ways depending on requirements.